It’s back to school time, which for most families means the start of a super busy schedule. Jason and I discovered that when our schedules get hectic, our dinners tend to get a little boring – spaghetti, herb chicken or kielbasa. Not that there is anything wrong with those options, we love all three, but sometimes we feel the need to come up with a twist on the standard weekday meal. This flavor-packed pork dish is the perfect twist on a weeknight meal, giving your family just the right amount of energy to get through those stacks of homework. Marinade the pork the night before and it will be ready for the grill come dinner time the next day. To make the Ginger Honey Cinnamon marinade, whisk all of the ingredients together in a small prep bowl (except the pork chops). Reserve about a 1/4 cup of marinade for basting. 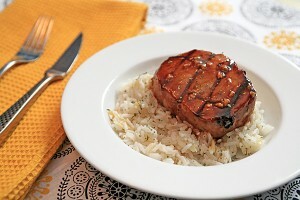 Add the pork chops to a bowl or ziplock bag and pour marinade over top. Use your hands to rub the marinade into the pork chops, making sure all sides are coated. Refrigerate for at least 6-8 hours. Preheat an indoor or outdoor grill to medium-hot. Grill the pork chops, for 12 minute. Flip the chops halfway though the cooking time. Baste pork chops with reserved marinade and continue to cook until thickest part reaches 145 degrees. Let the pork rest 5 minutes before slicing.